It's been a very busy past week. I had a nice sized class last Friday and got about $200 in orders toward my September quota. I attended a monthly stamp club on Saturday. Worked at the church last Thursday and Monday. 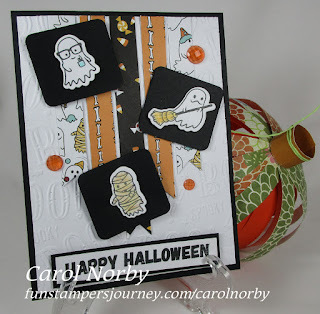 And finished my 4 Halloween cards for my September class. Whew! And on top of all this I've been dealing with allergies. 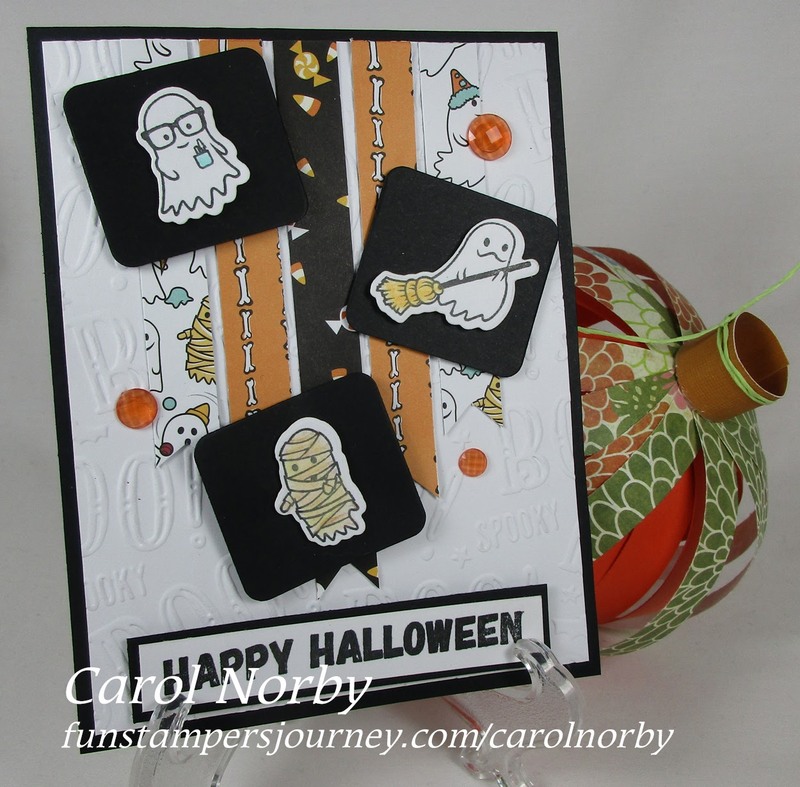 Now I get to work on my October class cards but will start that later. But today..... yep, Wednesday. Hump Day. Last Wednesday of August. And WOYWW! 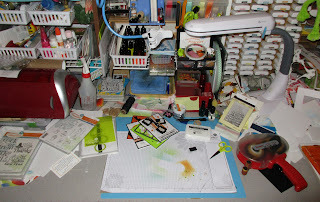 Your day to view not only my desk but many others, should you decide to check out the links (please do!). All this fun view of desks is put together by Julia at the Stamping Ground. And many times you get more than just desks! You'll get to view projects, products, scenery, and who knows what! Today (actually this photo was taken yesterday afternoon) my desk is just winding down as I got done taking photos of my Halloween class cards And there's something I've never had before on my desk. Can you guess? It's top center. I have a phone holder clamped to a shelf for now as I figure out the best location to do some live FB videos for my customers and team. So what else is on my desk? 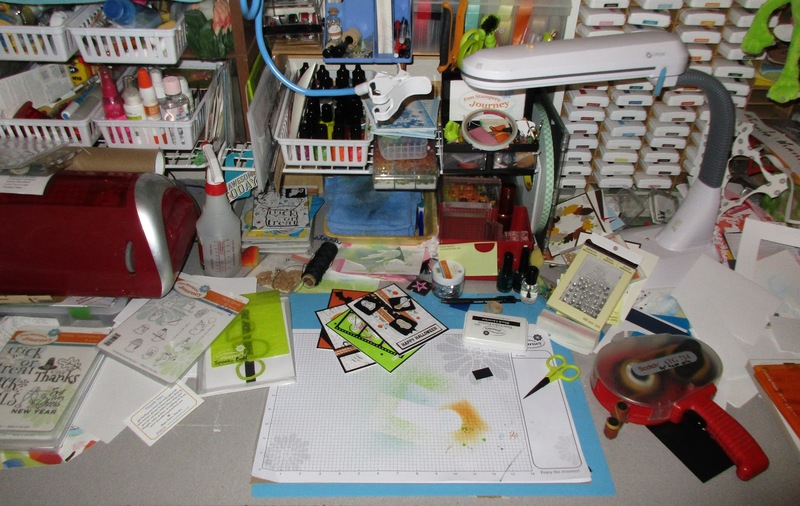 Well, far left front some stamp sets, embossing folders, and dies. Center front, the pile of 4 Halloween cards, an ink pad, bottle of sequins, roll of black twine, and odds & ends. And far left front, my ATG adhesive roller, a package of clear rhinestones, scissors, and scrap paper. All across the back are baskets of supplies, cleaning rag, acrylic blocks in their red container, and ink pads in their rack. And I supposed I can share one of my Halloween cards with you. All products used are from the company I'm with. This card is relatively simple but I like how it turned out. Love our printed paper and these little ghosties. Ok, now please head over to the Stamping Ground and check out more. How knows, we might cross paths along the way! Hi Carol. You've been busy! Well done. Congrats on the success of your class! That must be a fun job. 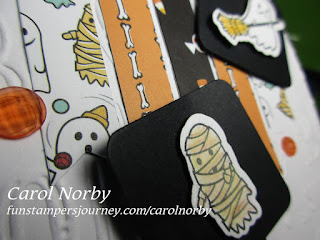 Cute Halloween cards - have a great class.